Apparently, the new fad is lomography. Everyone else who writes random crap on the medium of the world wide web has already weighed in on the perils and pleasures of the LOMO Kompakt Automat camera, so now it’s my turn. I have been a careful and precious photographer for many years. When I travel and vacation, I prefer to travel alone. This gives me a sufficient amount of time to take photographs of minutiae and landscapes from dramatic, calculated angles and to sit in hunched, spiderlike positions until the sunlight suits my fancy. I am patient and particular, which is why it’s good that most of my photographs are not of people. If you look at many photo albums from people’s travels, you will find that most of the photographs are almost exactly the same. Here are Joe and Amy in front of the Acropolis. Here are Joe and Amy in from of the Leaning Tower of Pisa. Here are Joe and Amy in front of the airport. The smiles are the same, the clothing has few variations, and while the order may change (Here are Amy and Joe in front of…), the only real difference is the background. What is the purpose of these photographs? Proof? This photograph categorically proves that the vacationers have in fact stood in front of something homogeneously famous. Woo. In the days of Adobe Photoshop, this is not particularly categorical. Also, I’m not precisely sure what the merit is of a) having dozens of virtually identical photographs of you and your travelling companion are, or b) taking photographs of partially obscured great works or scenery and architecture. You already know what you and your travelling companion look like, but the details of the ruins of the Glastonbury Cathedral are not so easily brought to mind without photographic assistance. My father, on the other hand, prefers photographs with his travelling companion standing near the edifice. “For scale,” he says. Not a bad use of people in photographs, but I still prefer my pictures human-free. I will wait for a considerable time, my eye squinting through the view-finder and my finger tense over the shutter release, waiting for the split second when tourists are no longer marring the composition of my picture of, say, the Lion’s Gate of Mycenae. Bloody tourists. So I am perversely interested in the LOMO camera. With such precision and pain-staking attention to exactness, I occasionally yearn for a camera sans buttons and knobs and dials and settings. A camera that you wave at the intended target, take a picture, and damn the consequences. A camera that doesn’t make people squirm and shift and demand that you take the damn picture, already. The versitility of its light meter and automatic shutter functions apparently allow for excellent and sometimes unintentionally artsy photographs in almost any condition or setting. When I first heard about these babies six months ago or whenever, I knew I wanted one as my second camera. I figured I probably go LOMO before I went digital. With the recent deterioration of my primary camera, you’d think that I’d ratchet my LOMO-purchasing plans a notch closer to actually happening, but this is not the case. Han Duong recently brought my attention to another camera available under the LOMO umbrella, the Loreo 3D. 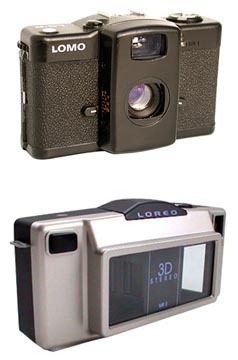 The Loreo creates stereographs, photographs that are the 1930s predecessor the the View-Master. While it may seem silly to buy a secondary camera that doesn’t take normal photographs, especially when my primary camera is essentially non-functional, I will have this camera. It dovetails nicely with a recent resurfacing of my love for View-Masters, and the ability to create my own 3-D images is just too cool for words.